Mo sat high on a shelf in an airport gift shop. Every day he watched as people rushed by. He wondered where they were going, and what they were like. Often, he’d see a mother and a father and some children and he’d long for them to come into the shop and buy him, but no one ever did. More than anything, Mo wanted a family. He wanted a home. Mo’s feelings echo those of any child living in an orphanage, watching people and families going about their own busy lives. When Mo finds himself in the company of a man and a woman, he wonders where they’re going. When they land in Russia, he asks if it’s their home. And at the orphanage, he wonders who they are seeing. Throughout the whole book, it’s Mo’s uncertainty that we hear, which of course reflects the child’s feelings. It is for these children Bashista has written Mishka: An Adoption Tale. This is quite a beautiful book, both the detailed illustrations and the story are captivating and heartwarming. Mishka walks the reader through the process: the initial visit between prospective parents and child, then claiming the child and getting the paperwork in order, and finally the going home. However, it’s not an “instructional” or even a chronicle of events, instead it’s written from the point of view of Mo the bear who is the thread that connects the couple and the child throughout the story. I really enjoyed this book, and I’ve read it three or four times already. I just can’t stop smiling whenever I look through it. Mo the bear’s body language and facial expressions change on each page, expressing the feelings of the moment. He is the ball in the game of catch, and he is the comfort object during the couple’s absence. I really loved this book. I liked Mo the bear and want one of my own. They should make a Mo to sell with the book so I can hold him while we read the book. My favorite part is when the man and the boy play catch with Mo as the ball. I think this book is so sweet! And I love the drawings, they’re pretty. The book has two stories in it. One story is about the little boy’s adoption. The other story is about Mo the bear getting a family and a home. I thought the part at the beginning when he’s on the shelf and nobody wants to buy him is sad, but if somebody had bought him then he wouldn’t have been Yuri’s Mishka. This book is for children in Russia who are getting adopted. I give this book 100 stars out of 5 stars. I really really liked it! Mishka: An Adoption Tale is a perfect book for a classroom reading time book for ages 4 through 8 (though, Maggie’s 9 and loved it, too). It’s a wonderful conversation-starter and I found myself, quite unexpectedly, telling Maggie about how I had considered giving her up for adoption while I was pregnant with her. We talked about that for a while, as I explained to her that I had thought of it because I had wanted her to have the best life possible. I couldn’t do it, obviously, and I’m very glad I didn’t. I think the process makes her special to me because I chose to keep her. And I think adopted children are loved with that same special love because they were also chosen. The ability of a book to draw out discussions of more difficult subjects without effort is a characteristic of an exceptional book, as is the ability to carry the reader along without the reader seeing the process, and Mishka does this. 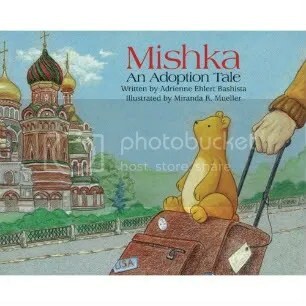 Don’t forget to enter to win a signed copy of Mishka: An Adoption Tale!